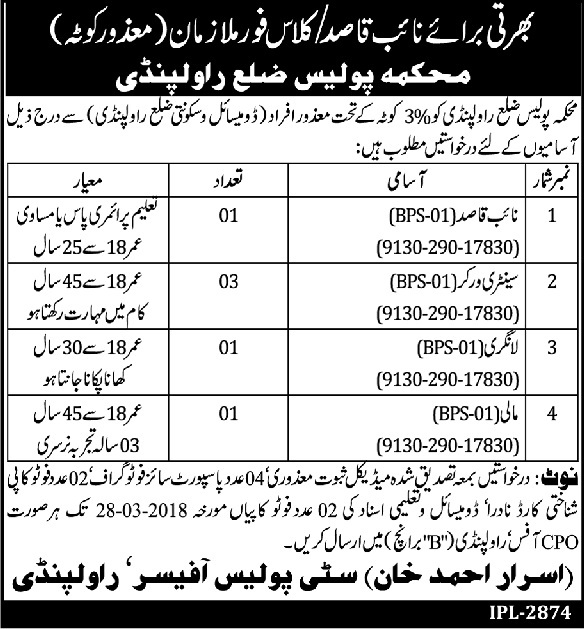 Government of Punjab has announced 06 New Jobs in Police Department Rawalpindi Published in Daily Ausaf Newspaper 07th March 2018. These Jobs are for only Disabled Persons and Only District Rawalpindi Domicile Candidates can apply for these jobs. Interested Candidates who have required qualification as well as disabled Certificates from Punjab Medical Faculty can apply for Sanitary Worker, Naib Qasid, Laungary and Gardener. Applications should reach in the office of CPO Rawalpindi before last date.